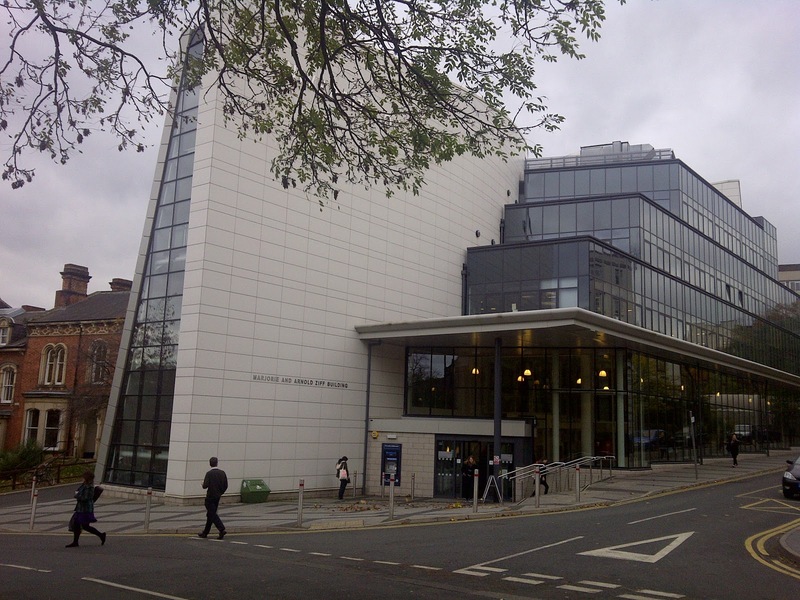 On the University of Leeds campus we often find new buildings 'shoe-horned' into small 'leftover' spaces, much like the Marjorie and Arnold Ziff building which was opened for business in January 2009 and operates as an administration centre, primarily for students. The building appears squeezed in between the end of a Victorian terrace and one of the lecture blocks, the Michael Sadler Building. This recent building has the effect of drawing attention to the buildings either side of it if you make an effort to look, but despite these architectural differences urban space operates such that it naturalises the very space that it forms, hiding those differences. Postmodern space is hugely complex because of the history on which it sits; yet there is a type of homogeneity also operating which smooths that space and presents it to the viewer like it has been that way 'forever'. This is one of postmodernism's paradoxes well noted by Fredriç Jameson. He explains how the notion of a dialectic opposition is not something that appears in the analysis of postmodern society in the same way that it did in a more modernist or Marxist period. (2009: 344) He goes on to say that the cultural objects considered under postmodernism often seem to "fold back into each other". (ibid.) This is apparent when viewing postmodern space, especially in the examples Jameson offers, such as the Westin Bonaventure building consisting of four mirrored columns which simply reflect Los Angeles back to itself. While it would not be possible to describe the Marjorie and Arnold Ziff building with the same intensity that Jameson describes the Westin Bonaventure - it is not exactly a postmodern hyperspace - it does share some of its qualities, to varying degrees. There are two entrances to the Ziff building. The main one is obvious and is the one that you would first come to if you were encountering the campus from the main university entrance. Here you are taken in to the queueing area that students who require administrative assistance would use. There is also a staircase straight ahead that takes you up to the café on the floor above, which once you are a few feet into the foyer, you can see opening up at the top of the stairs and overlooking the administration area. However, from the other end of the building there is a much smaller, less obvious entrance which takes you on to a level which is between these two floors, requiring you go down a few steps to enter the student admin area, and up a few steps to enter the café. This is slightly disorienting if you have previously only ever entered the main entrance before, as you are not necessarily aware of the slight incline on which the building is built, even if you regularly walk that slight uphill path on your way elsewhere. 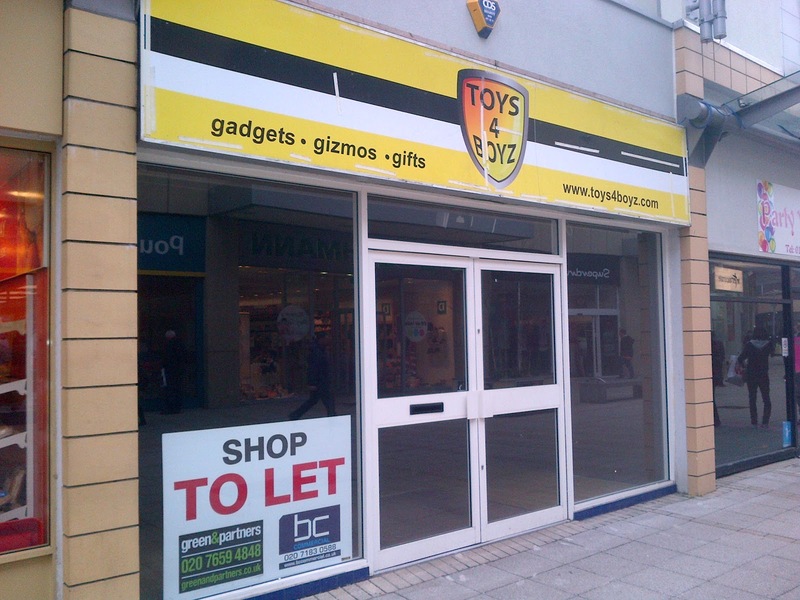 The image below shows almost the full length of the building on that side, which is not a great distance. However, it is enough to mean this smaller entrance cannot take you directly onto the ground floor of the building inside. Once just inside this other entrance, while you can work out where the administration area is in space (it is still visible from outside these windows you see in the image above), the café has suddenly disappeared from view. It is closed in at this end of the building and it requires a moment for you to realise that you are entering the building on a different level, and that since there is only one staircase that goes up, it must be that direction you need to take. 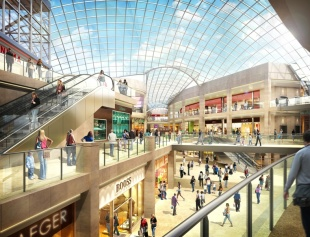 This disoriented moment is fleeting, but nevertheless is a common side-effect of postmodern buildings, an example of which was recently expressed to me by a friend attempting to orient herself in the newly opened shopping centre Trinity Leeds, which truly is a postmodern hyperspace. Part 2 of this blog will look further at the mirroring effect of the glass surface of the Ziff building. Bibliography: Jameson, Fredriç. 2009. Postmodernism or The Cultural Logic of Late Capitalism (London and New York: Verso). In part 1 of my blog I took a general look at some of the changes in King's Lynn since I left in 1987. 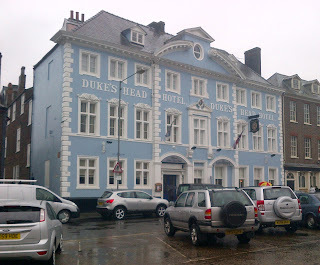 This blog is going to discuss a couple of the buildings in the town, starting off with the new(ish) St James Street Car Park which Kevin Beresford of the Car Park Appreciation Society describes as "without compare" in his AA sponsored research on the docking of the country's favourite piece of technology. 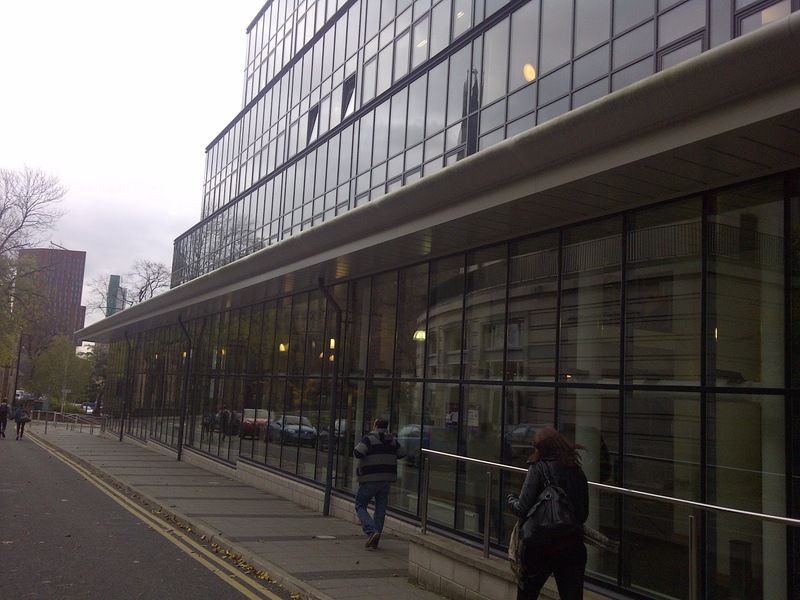 The architects were Pullman Associates and it was completed in 2005 at a cost of £6m. Beresford goes on to describe the 700 parking space car park, in very prosaic terms, as "spacious, well-lit and adorned with beautiful red brickwork, complemented by slinky silver vertical aluminium fins that create a rippling wave effect." 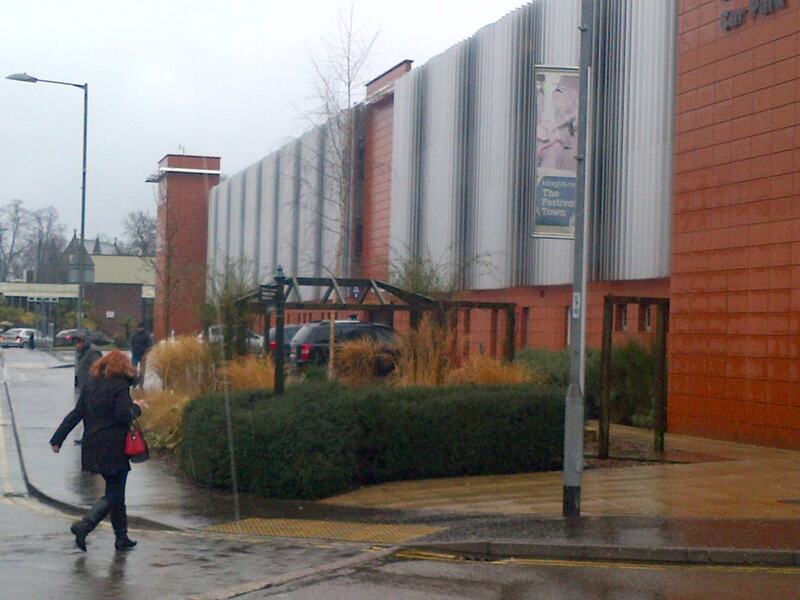 Although I'm not an expert like Kevin, I must admit when I first saw it I thought it was a sports hall. But, I quite liked the look of the building, despite the poor light on a dreary day. It is much more attractive than most car parks. Kevin, it seems is also the founder of the Roundabout Appreciation Society, so clearly an authority on urban décor. 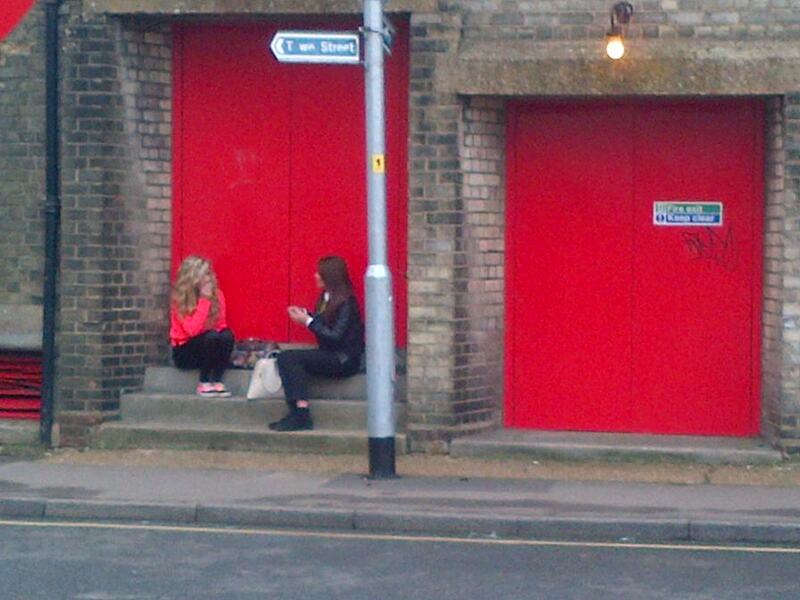 This is the Granary on the edge of a the Baker Lane car park. It is now a residential conversion with modern flats also attached to it. I like the building, I always liked it as a child. 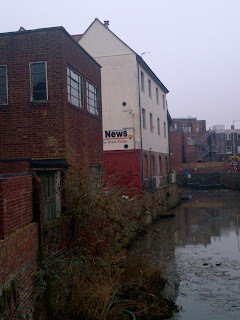 I'm pleased it hasn't been pulled down, although half of two sides of it are now hidden by the new flats. This is what Wikimedia Commons says about it: "Original site of the 'Baker Lane Oil Cake Mill', a four-storey linseed oil mill and warehouse that was destroyed by fire in 1899. Rebuilt for Henry Leake and Son in 1900, making linseed cake for cattle feed. 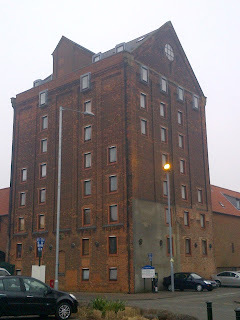 This tower became a granary after 1945, and was retained (converted) as part of a courtyard complex of residential apartments built and converted from between 1985-87." So it looks like it was converted at just about the time I left KL. 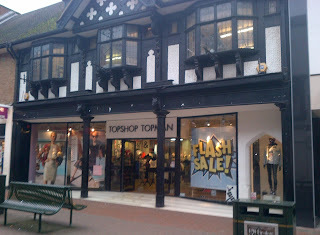 This is Top Shop in the High Street. It was Boots the Chemist a long time ago. It was very close to the site of Ladymans, a lovely little deli that I used to visit with my Mum. 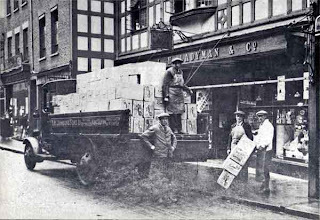 The architecture was very similar, as you can see in this photo of Ladymans below. Ladymans was quite 'posh' and had a nice cafe upstairs with a balcony overlooking the deli downstairs. Entering Ladymans was like entering the past. Even in the sixties it still had little pulleys attached to the ceiling that moved the cash and receipts around the place, I guess to the accounts office. 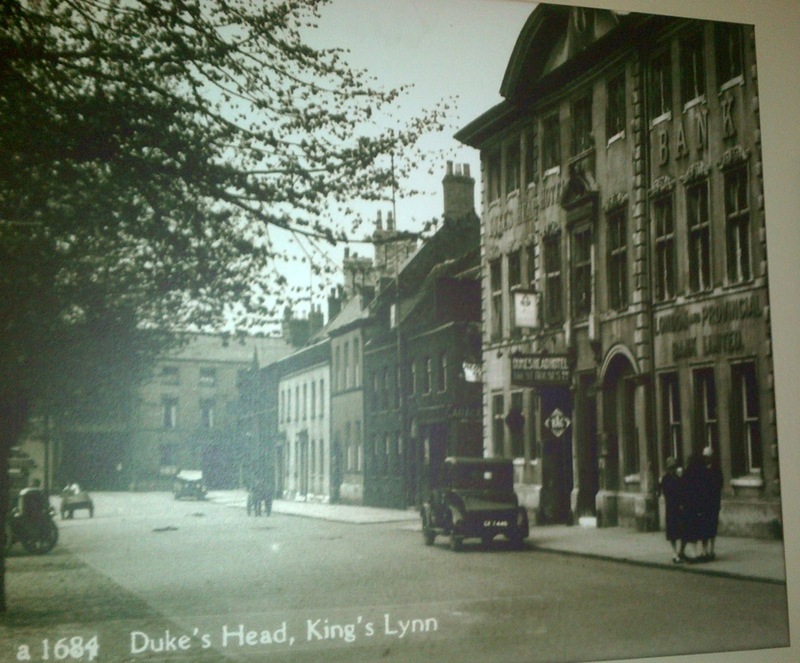 This is my last blog on King's Lynn, but there is an upcooming blog about ye-old-record-shope phenomenon soon, which will also mention King's Lynn. Last weekend I visited the town of my birth for a work reunion, King's Lynn. 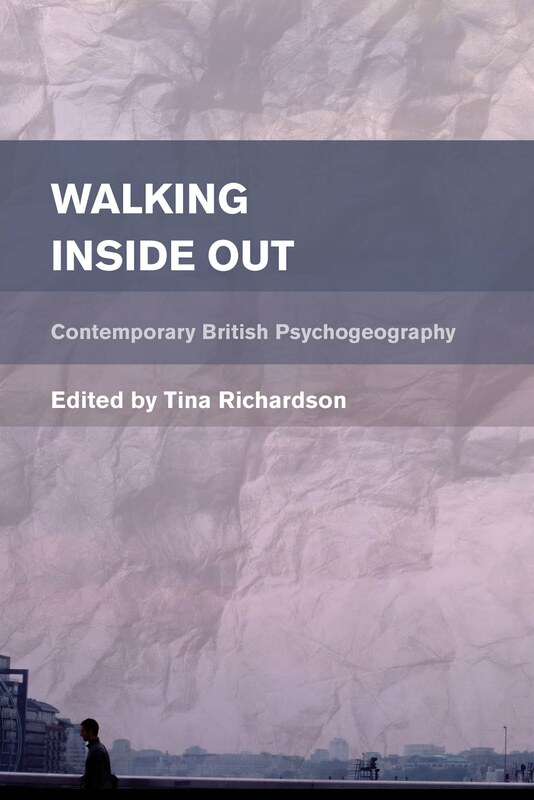 I left there in 1987 and while I have been back to the town on occasions, this was my first visit as a psychogeographer. 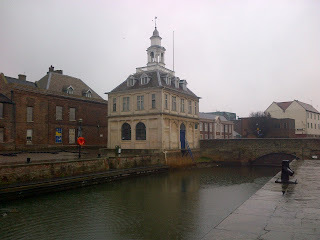 The first image is of the Custom House. We were told, as children, that it was designed by Christopher Wren. Actually it turns out the architect was Henry Bell. 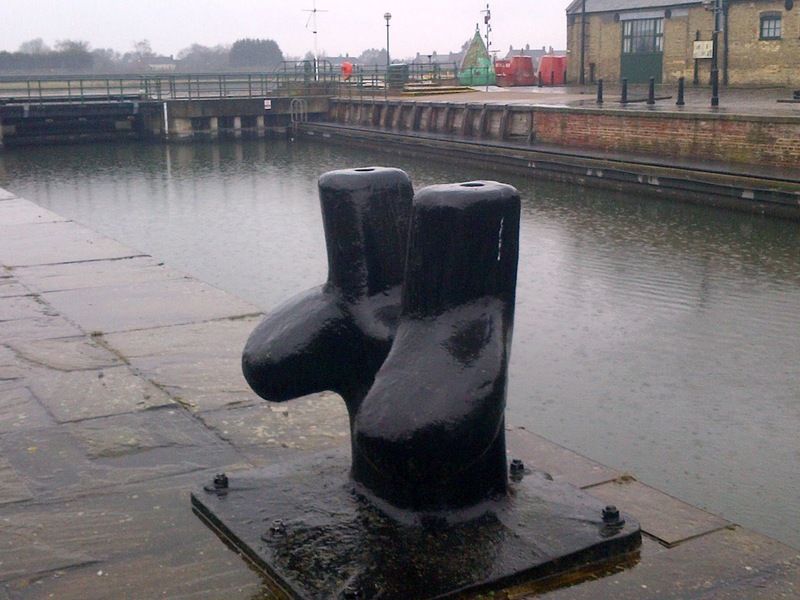 If you look towards the Great Ouse river from here, you will see a quayside which has been hugely developed in the time since my departure. If you cross the bridge nearby and face towards the town, you will see this seemingly insignificant area (below). However, this was used in the film Revolution (Hugh Hudson1985). A lot of this part of King's Lynn was used in the film. This photo shows the area that was turned into a brothel. Many people in the town were extras - although not necessarily all as prostitutes, may I add. 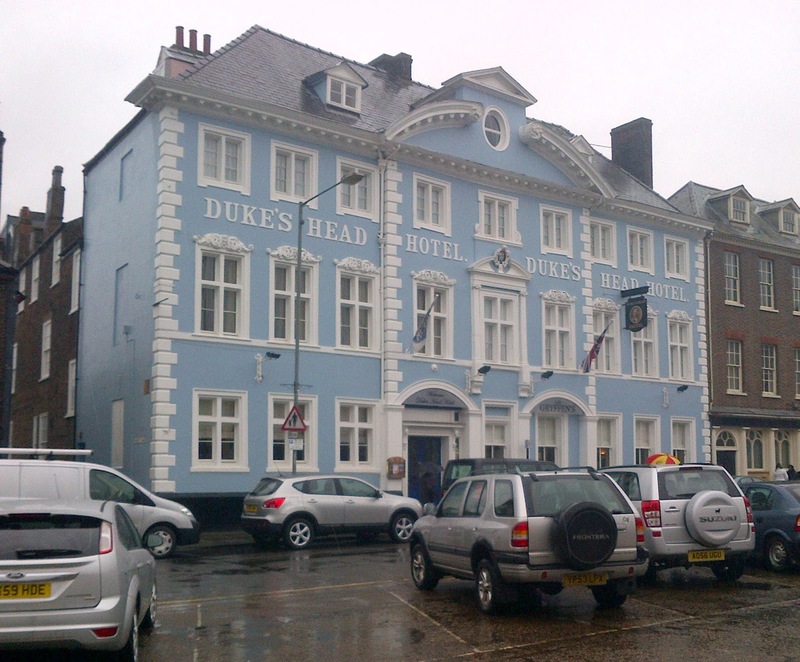 Another well-known building is the Duke's Head Hotel not far away from here, in the Tuesday Market Place. This is where I took my first job in service - well not 'in service' exactly, rather more as a hotel receptionist in 1979 - in the days when desirable work skills were still things like being able to use a switchboard (if you are younger than 40, you may need to look this up on wikipedia). You can see from the above link that it was pink at one time. It was also pink in my day. Today it is blue, as you can see below. The tiny window at the top/middle was my bedroom. In the café in the hotel they still have an old photo of the hotel, when it was a bank. I didn't like the recently redeveloped New Conduit Street at all - it is just another homogenised consumerist manifestation. It's all been (post) 'modernised' and the pedestrianised road is now very narrow and closed-in - why have open space when you can create more places for buying? There used to be more of a piazza feel about this road, with an open area near Jarrolds the stationers. If, as a visitor, you only saw this part of the town it would be easy to have a low opinion of the architecture. 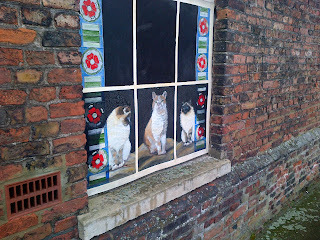 You really do need to make an effort to seek out the interesting buildings (more about this in part 2 of the blog). 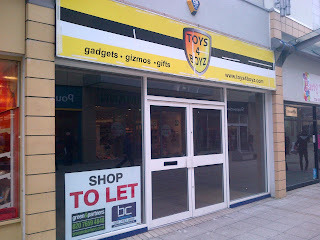 Also, there are quite a few closed shops. Anything from modern shops to more traditional buildings. 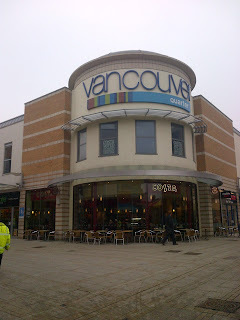 This is a new building and is the home of Costa (below). 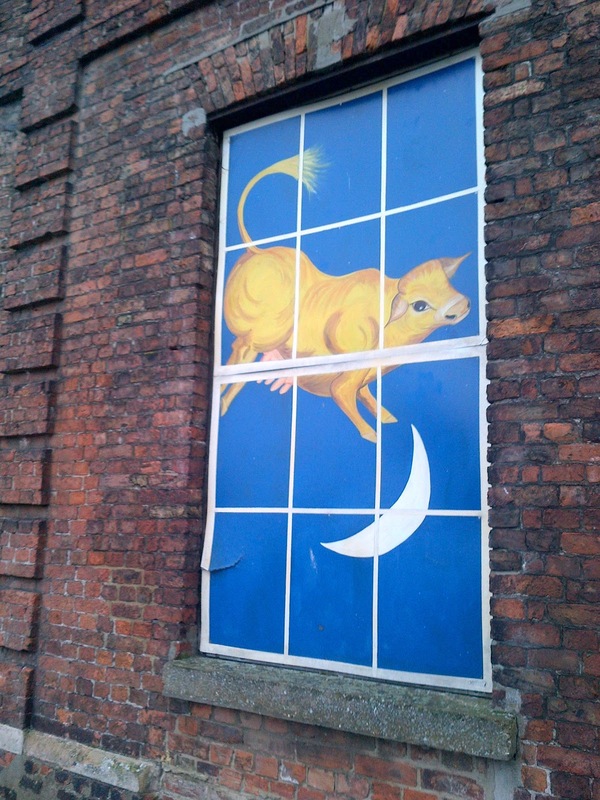 I feel there has been some attempt to take on some of the aesthetics of nearby buildings. 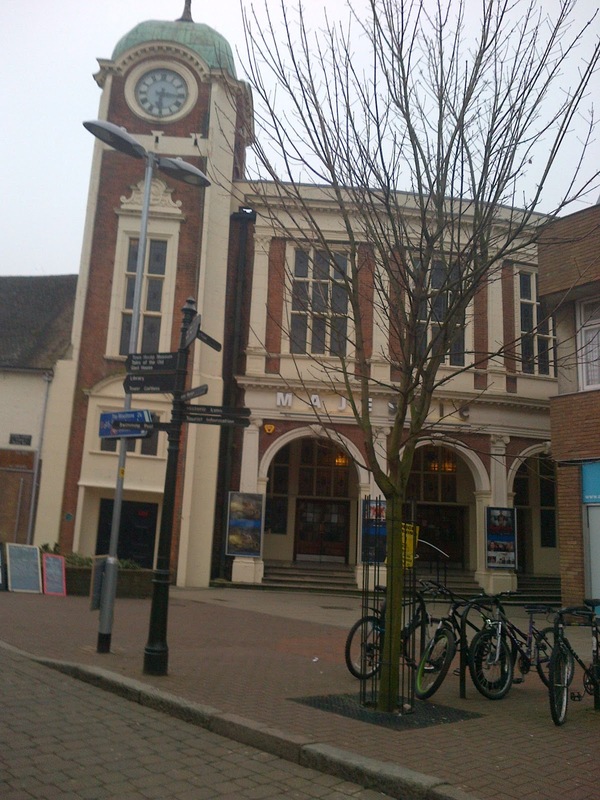 The image below that is the Majestic Cinema which is close to Costa. 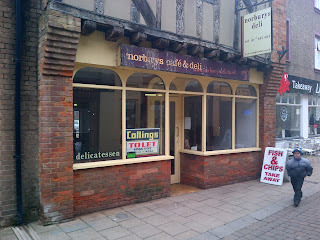 See the cream paintwork and peach/red bricks in both buildings. Also, Costa does have an art deco-ey feel about it, with the horizontal lines, etc. The Majestic is now a grade II listed building (built in 1928). 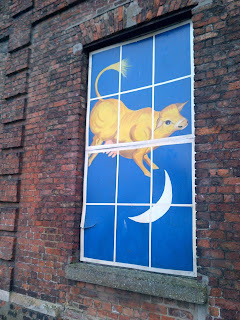 We used to go to Saturday morning childrens' cinema there in the sixties. There was also another cinema called The Pilot in those days. 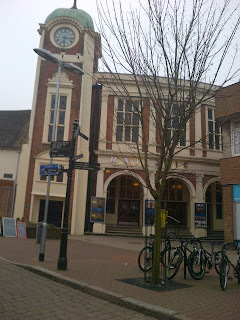 The Majestic survived being replaced by a multiplex quite recently - hoorah!! 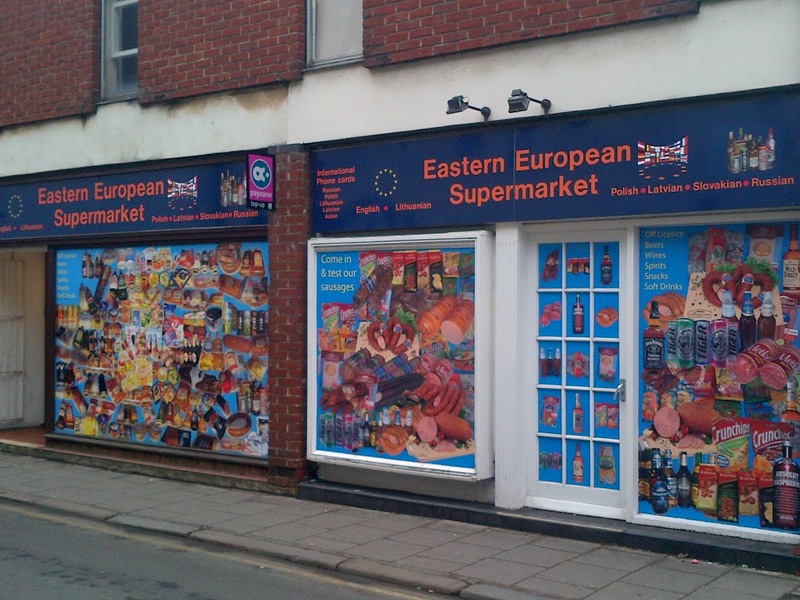 The Eastern European Supermarket in St James Street reflects the evolving culture of the town. I was trying to find some data to compare the demographics between my time and today, and stumbled upon what can only be described as a stereotypical Daily Mail response to Britain's immigration, in an article entitled Record Levels of Immigration Lead to Jam-Packed England. It was a comment posted by Very Opinionated of King's Lynn: "Romania's 2011 census 19.00 million down from 21.70 in 2002. Any co-incidence???" 38 people have rated this comment as positive, no-one rated it as negative! 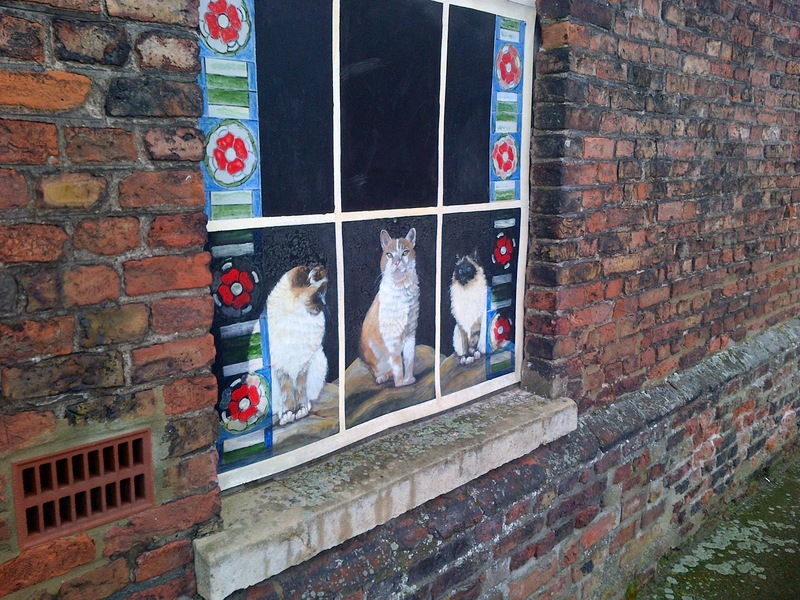 On that note...I'll leave you with a lovely (and cute) painted window of some cats which is right next to the Custom House. Walter Benjamin explains how: “Buildings are appropriated in a twofold manner: by use and by perception […].” (2004, p. 526). It is the perception of the temple that is the guiding force in terms of the aesthetic experience for the Greek peoples. The internal model they have of it, in regards to the concepts that define its intent, is what feeds into the feelings they have upon observing it. The same applies to those viewing the Parkinson Building. Louis Althusser explains that ideology is part of all human activity and “is identical with the ‘lived’ experience of human existence itself [...]” (1971a, p.223). Thus it is impossible to say where ideology ends and aesthetics begins: “The aesthetics of consumption and the aesthetics of creation are merely one and the same.” (Althusser 1971b, p.230). This leads us onto the self-reflexivity of this ideological aesthetic relationship. Heidegger says: “The temple, in its standing there, first gives to things their look and to men their outlook on themselves.” (2000, p.89). He explains that “the work” sets up the world and gives meaning to this opening (2000, p.90). The temple had been created by the people for their gods, but in that very act of creation, in that singularity that not only denoted a new moment in history but also saw representation as symbolising knowledge, man had forgotten that he was the creator of the temple. In a bizarre kind of cultural amnesia the temple as representation was forgotten and instead formed the ground upon which man based his life, it became “the naming power of the word” (Heidegger 2000, p. 91). The temple became the primary position from which all other positions were related: “In the beginning there was the word. The Word was with God, and the Word was God.” (John 1: 1– 3). The structure which controls the concrete existence of men, i.e. which informs the lived ideology of the relations between men and objects and between objects and men, this structure, as a structure, can never be depicted by its presence, in person, positively, in relief, but only by traces and effects […](1971b, p.237). Ideological “traces and effects” are subtly sutured into our very lives and become naturalised to the extent that we may need to step out of ourselves for a moment to notice them. They permeate the world around us and exist in the very objects that feature in our daily lives. And, the reason they are unnoticeable “presupposes that ideology itself” (Althusser 1971a, p.225). Thus the world was made to appear, at every instant, as a successful solution of God’s own tensions, as an ever new vision projected by the grand sufferer for whom illusion is the only possible mode of redemption. (Neitzsche 1956, pp.9-10). However, an absolutist reading of the ideology of the object would be challenged within the poststructuralist framework. In the postmodern world where "The absence of the transcendental signified extends the domain and the play of signification infinitely." (Derrida 2004, p.34) all meaning can be considered subjective. Heidegger explains how this emerging of the world continues providing “god has not fled from the temple” (2000, p.89). 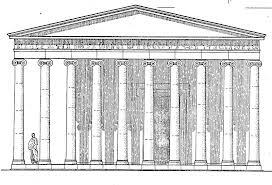 Therefore in this lack of awareness of praxis, this cultural amnesia whereby the Greek peoples forget they are the originators of the temple, the temple thus creates them. The power imbued in it makes it appear as something ‘out there’. 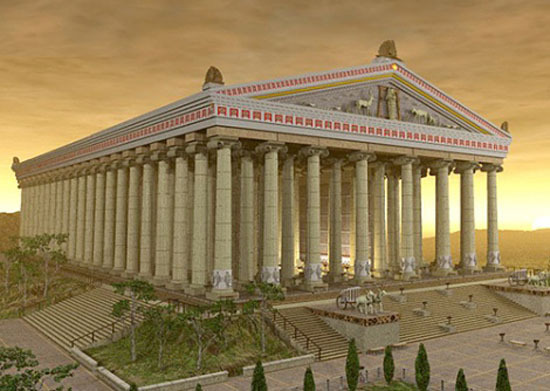 The Greeks followed the rules and dictums of the temple and in that practice the original event was forgotten. So, in effect this aesthetic experience is narcissistic, man is taking pleasure in himself. This is what Althusser describes as “the mirror-reflection of the subjectivity of consumption” (1971b, p.231) and what Nietzsche refers to when he says that the Greeks saw themselves in the images of the gods, what he calls the “esthetic mirror” (1956, p.32). The process of the “opening of the world” (Heidegger 2000, p.91) and the “setting forth” (ibid.) of the temple-work is reciprocal. As Theodor Lipps says: “aesthetic pleasure is self-pleasure” (cited in Rieser 1957, p.243). Man marvels at the objects of his own creation and, in this self-forgetting, misinterprets the image in front of him, himself, as the face of God. Althusser, Louis. 1971a. ‘A Letter on Art in Reply to Andre Daspre’, Lenin and Philosophy and Other Essays, trans. by Ben Brewster (London, New York: Monthly Review Press) pp. 221-228. Althusser, Louis. 1971b. ‘Cremonini, Painter of the Abstract’, Lenin and Philosophy and Other Essays, trans. by Ben Brewster (London, New York: Monthly Review Press) pp. 29-242. Bayer, Patricia. 1992. Art Deco Architecture: Design, Decoration and Detail from the Twenties and Thirties (London: Thames and Hudson). Benjamin, Walter. 2004. ‘The Work of Art in the Age of Mechanical Reproduction’, Art in Theory – 1900-2000, ed. by Charles Harrison & Paul Wood (Oxford: Blackwell Publishing) pp. 520-527. Derrida, Jacques. 2004. Writing and Difference, trans. by Alan Bass (London: Routledge). Foucault, Michel. 2005. The Order of Things (Abingdon, New York: Routledge). 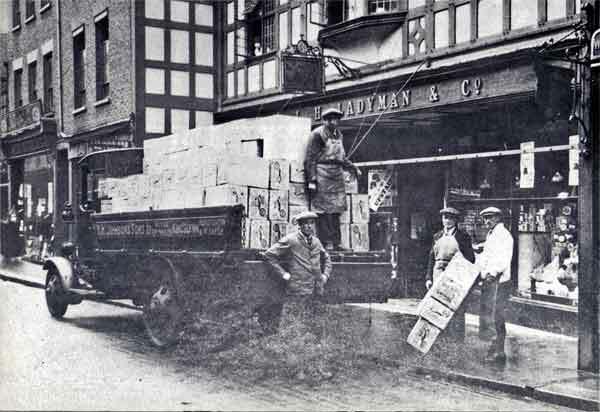 Gosden, P. H. J. H. and Taylor, A. J. 1975. Studies in the History of a University 1874-1974 (Leeds: Arnold and Son). Hegel, G. W. F. 2000. Extracts from ‘Aesthetics: Lectures on Fine Art’, The Continental Aesthetics Reader, ed. by Clive Cazeaux (Abingdon: Routledge) pp. 35-52. Heidegger, Martin. 2000. ‘The Origin of the Work of Art’, The Continental Aesthetics Reader, ed. by Clive Cazeaux (Abingdon: Routledge) pp. 80-101. Nietzsche, Firiedrich. 1956. The Birth of Tragedy and The Genealogy of Morals, trans. by Francis Golffing (New York: Doubleday Anchor). Rieser, Max, ‘The Aesthetic Theory of Social Realism’, The Journal of Aesthetics and Art Criticism, 16, 2 (1957) pp. 237-248. Scully, Vincent Joseph. 1979. The Earth, the Temple and the Gods: Greek Sacred Architecture (New Haven, London: Yale University Press).